I bought a scarf that I LOVED from a fancy store in the mall about 5 years ago. The thing would never go out of style because it was perfect. An extra long scarf in a gorgeous cream color with a loose knit look, and long soft tassels. My all time favorite scarf! And then….I washed it. On accident. In hot water. It turned into a tight, felted, stringy rag. It still sits in my closet, and I pull it out occasionally to make sure I indeed ruined it THAT bad. I pull it out, look at it, and lay it back in it’s eternal place of rest. Where am I going with this? This scarf is my replacement. Somewhat the same, yet different. I have added black. Black and white goes with so many things, and it gives me the feeling that I am sophisticated. Black and white does that to a person, ya know! The black is worked in a garter stitch, so you get a fun little popcorn like look on the black sections. I used GIANT needles, and super bulky yarn to get the look I was going for. If you have done a few projects or have a bit of experience, you can knit this up in an evening. 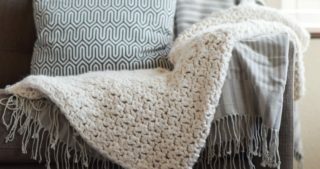 If you are a beginner and know knit and purl, this is easy enough for you to do. It is worked in sections of garter and stockinette stitch and seamed together at the end. ** Stockinette tends to curl, and this does indeed bow inward. It doesn’t bother me a bit, and I actually kind of like it. However, if you don’t like curling, you can do the entire thing in garter (knit) stitch. Of course it will be a different look, but will maintain the big chunky look with no curling inward. You will make THREE alternating sections of white stockinette, and three of black garter. Once you have completed all sections, you may seam the ends (one white end to a black end) together in whichever method you prefer. The simple whip stitch worked fine for me. Weave in all ends. We are getting blasted with another cold front, so this scarf will be put to good use this week! Stay warm out there! If you liked this, feel free to subscribe to my newsletter with my free patterns by inputting your email. or subscribe to the blog. You can also follow me on Facebook, or Pinterest. Thank you so much for visiting! This is a much better solution to fashion and function! Thank you! PS. Sarah White from Craft Gossip sent us here. I love this scarf and hope to make it for my daughter. But, since you still have your shrunken scarf, have you tried any of the methods on this web site? You might get lucky and then have 2 favorite scarves! I will sign you up! Thanks, Sherry! That will be a gorgeous color combo! I’m enjoying your site! 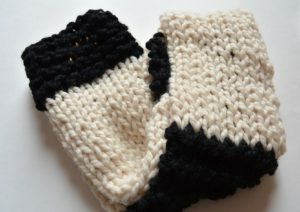 Hope to make your scarf next! Hi Carolyn, Good question. I did not twist it. I considered doing that, but just seamed it without twisting. I adjust it once I put it on (as with any scarf) for it to look nice. Let me know if you have any other questions! For this scarf, you don’t bind off first. Most of the time you just add a color without binding off. 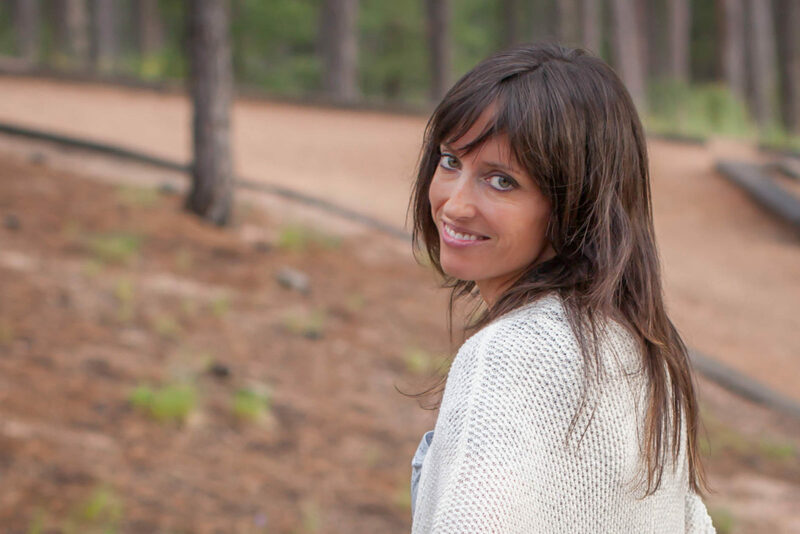 I am like you, totally self taught – youtube was my teacher! I suggest going on youtube and typing in the search “how to change colors in knitting”, and click on some videos. I had to be able to see it in order to know what I was supposed to do. Hope that can help you! Great advice. I haven’t knitted in a long while, so this is a good source for refresher material. Going to get he needles and yarn tomorrow. Love this scarf! Hi Pat! So glad you like this scarf. Thanks for letting me know! You can always share a picture of the finished scarf over on my Facebook page. Enjoy! I REALLY WANT YO MAKE THIS, EVEN IF IT IS 75° HERE. UGH. I WISH IT WAS COLD AND RAINY! I wish it were 75 here right now 🙂 I understand your feeling though. 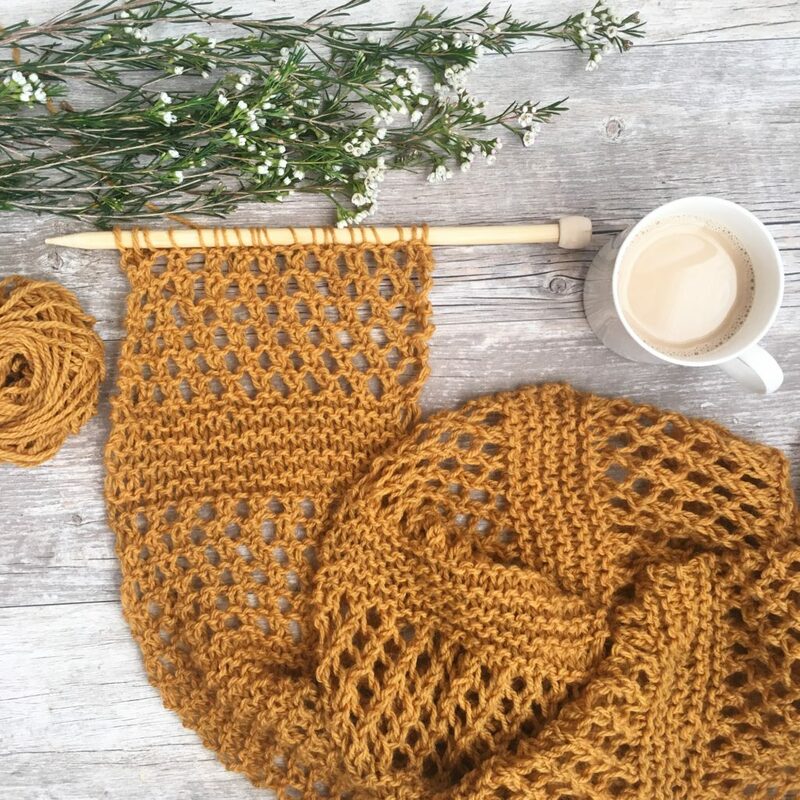 I keep seeing great winter things to knit, but I can’t justify it with summer coming up! Washing wool is very easy. The secret to washing wool is to RINSE in the SAME temperature that you wash in. Because I wash knitted garments by hand I use hand hot water with a gentle detergent. The warm water allows the long wool fibers to open up and let the dirt out. Then when you rinse in same hand hot water the long fibers do not go into shock and shrink – they are simply rinsed. (you can even do a bit of controlled spin drying to get the heavy water out – gently fold the garment in the water – gather it and lay it in the washer and set the spinner for a short time – until the ‘loose’ water is gone .) Lay the garment out on a dry towel – pull into shape and allow to air dry. Washing wool in cold water will not get it clean – over time the colours will become gray and the sweater will harden. 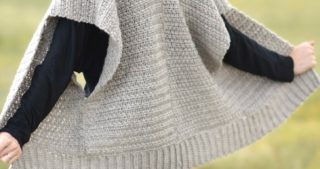 In Scotland, where I grew up dressed in Fair Isle and Aran sweaters, – the washing line was threaded through the arms of the sweaters, pulled to shape and pinned to the rope and the sweaters were allowed to dry in the wind. As to how hot the water should be – hand hot is good enough – though when I was training in a weaving mill in Scotland – the bolts of coat weight cloth were wound in a figure eight around rollers that were submerged in nearly boiling water. If, however, your piece has really shrunk – you might be able to pull it back into shape but it will never be the same. If it is felted – you might consider recycling the piece by trying one of the felting projects that are popular right now. Thanks so much Sarah for this awesome description on how to wash wool correctly. I honestly had no idea on the best way to wash wool. Really, I thought that you couldn’t wash it in hot water. It’s great to know that I can! You have a good idea to use my felted scarf for one of those popular projects right now. Thanks again for you helpful insights. Hi Jessica! I thought this pattern was very unique and liked the contrasting black and white “stripes”. My problem is that with patterns where I have to weave in a lot of ends, I can’t seem to make them look clean and neat. I also am not that great at weaving pieces together. Where the pieces meet will often make my otherwise very nicely knit project look raggidy. Any suggestions? Hi Janet! I too am still looking for the “best” way to weave in ends. 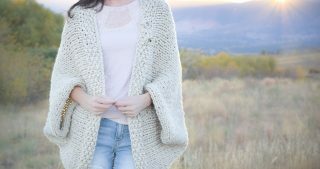 🙂 Here is a link that I try to refer to sometimes: https://www.purlsoho.com/create/2011/07/14/weaving-in-your-ends/ There are so many ways to do it. I hope this helps in some way. Thanks for the question! Thanks Jessica for the link. I have gotten better at weaving in the ends and there are so many ways of doing it. I’m guessing that the best way to do it is based on keeping them hidden, and not having them unravel. I love this scarf, but yours looks a lot better than mine. I knitted it twice. One I knitted with smaller needles and heavier wool and it had a nice appearance, but the one made from your pattern was lighter and more unique looking. The only problem I had was joining the 2 ends of the scarf. I used the mattress stitch and because there is black next to white it is obvious where I joined the ends. Should I have used a different stitch for joining? Hi Patricia! Love that idea to make it i their school colors. What a nice Grandmother they have with you! Thanks Linda…so glad you like it! I do not have a size 35 needle – Can I make this on a size 15 needle? If so, how many stitches would I cast on? I wish I knew exactly what gauge a size 15 needle would give you to tell you how many to cast on. You could try it with a size 15 needle, but the stitches of course would be smaller, it will take longer, and I don’t know how many to cast on really. I might go with 25 – 30? That just a guess! Sorry! It might curl a bit more too…I just don’t know. You could always give it a try and frog it if you don’t like it? Ooooo!!!! I have been dying to try the giant needles!!! Thanks for sharing this pattern…I’ll be working on this while the Trick or Treaters come on Saturday!!! Cheers!!! Thanks for the reply. My problem has been solved. Michael’s craft store has a coupon I can use. I am going to buy myself a pair of size 35 needles. I can’t wait to try this scarf. I have 4 teen-aged granddaughters that would love them. How sweet of you to make some scarves for your granddaughters. I’m so glad you were able to get a coupon in order to buy some big needles at Michaels. Perfect! It’s always fun to add more needles to our collections. 🙂 I hope you enjoy the scarf pattern. I have written it above in the pattern, but the stockinette does curl in a bit. 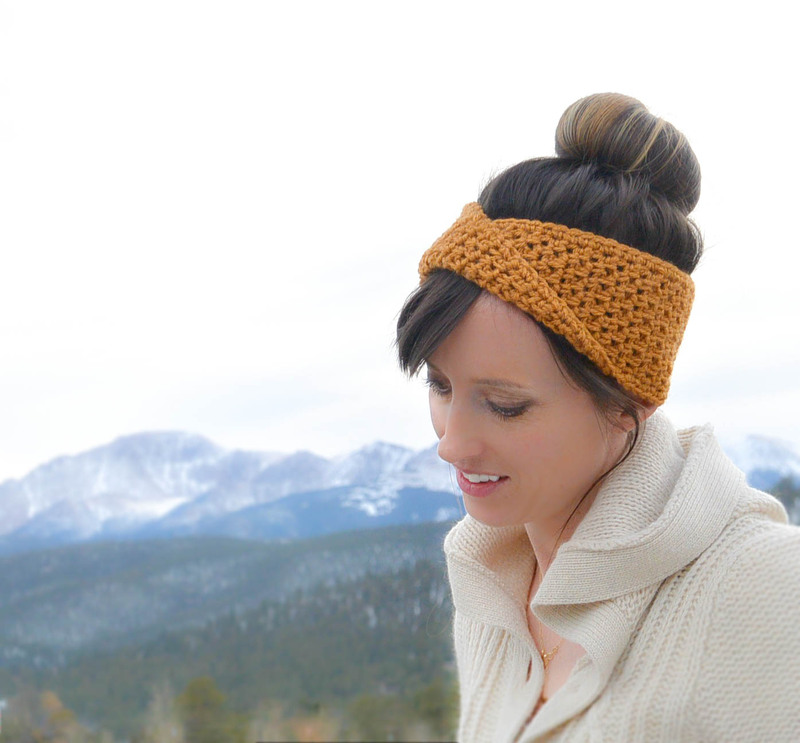 If that curling bothers you as you make it, you certainly can do the entire thing in garter (knit stitch). The look will be a bit chunkier as it’s garter. I just like to give people ideas and options. 😉 Enjoy! could use a nice silky yarn, would make a nice dressy scarf. Thanks again… love it! thanks for the update. I will give it a try in stockinette stitch and see how it goes. i am a beginning knitter. no interest in crocheting at this point. 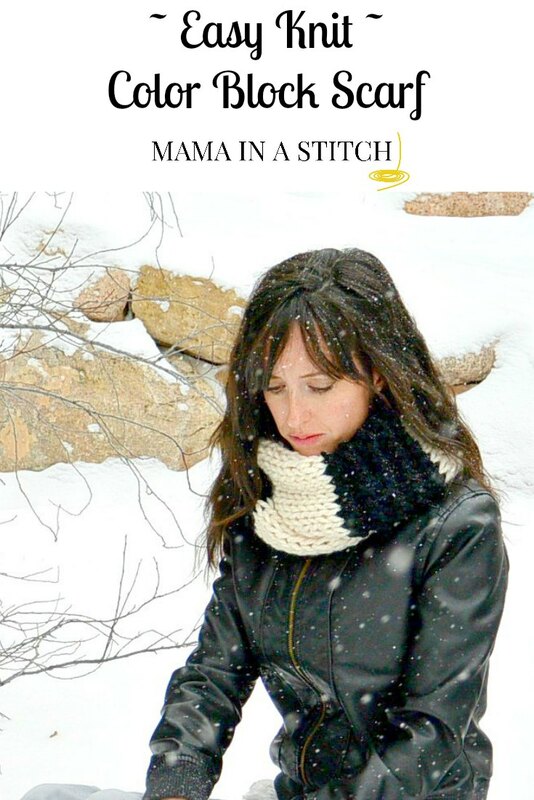 I have quite a few beginner friendly knitting patterns, hope you can find some that suit you! I’ve always wanted to try arm knitting. As for needles, I’d start with some large needles like 15s or 17s. 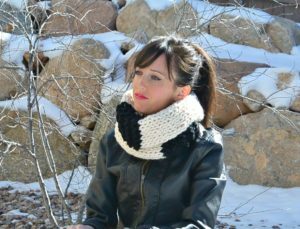 You can practice by making a simple scarf in only the knit stitch or garter (which is the most basic stitch). I think you’ll enjoy it! Stay warm and have fun making some good scarves! How did you avoid huge holes in your knitting? I’m only on the third row and already have holes. I usually knit pretty tight and I got the bulkiest yarn at the store but I’m a little disappointed. I’ll keep going and see if it gets better but if not, I may go back and buy smaller needles. Hi Bethany! It is definitely an “open” design because the needles are large. I am thinking that what you are seeing as holes is part of the actual design. It is made so there is space between stitches. I did use the super bulky yarn, but it is still somewhat loose. There shouldn’t be big, giant holes or anything though. You can see what it looks like in the pictures. As long as you are using the same yarn and needles, it should be as shown. Hope you can get it worked out to your liking! It is generally safe to wash wool in hot water – in fact when woolen fabric is woven it is washed in very hot water. The secret is to RINSE in HOT water. If you rinse in the same temperature as you wash your knitted item will be just fine. Also it is better to wash in hot water as this opens the long woollen fibres and allows the dirt to be washed away. cold water wash or dry cleaning will get dowdy and dull over time.